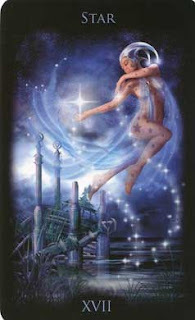 Today's Draw: The Star from the Legacy of the Divine tarot. When things are bad, where do you find hope? Is hope something within your command or is it a gift from God? And what's the difference between you and the most distant of stars? The Star is a card that signals hope, especially in hard times. As you can see from the rubble in the background, the city has been destroyed. The card just before this in the tarot is The Tower, a tower that has crumbled. So something in our lives has been beaten down to its very foundation and The Star comes along to say "all hope is not lost". Whatever has happened in your life, happens for a reason. The destruction or damage was necessary for you to rebuild on a stronger foundation. Getting this card is a sign of better times ahead. The cool thing about NDGT (as his fans call him), is that his mind is as blown by this as yours is. He's a leading astrophysicist. He's not some metaphysical guru and, in fact, like most scientists, does not even believe in God. And this blows his mind, too. He doesn't say this because it sounds nice or because he thinks it's what humanity wants to hear. He's the Director of the Hayden Planetarium and host of NOVA ScienceNOW on PBS. He says it because it's a scientific fact. We are stardust, we are golden, we are billion year old carbon,And we got to get ourselves back to the garden. I really love the thought behind those lyrics, because I think we get so caught up in our "king of the jungle" ego here on earth that we forget we are no greater than anything else that exists. It's all stardust. And we think we're the smartest and fittest, but on whose scale? Earlier versions of man had respect for the earth and its critters. They didn't have the wisdom NDGT has, but they sensed it within them. They had to. They lived and died by nature. Anyway, relating this back to the card, there is nothing outside of you the inside of you can't handle, manage or transcend. Hope—and the magic it brings and the change it promises—is not something that exists outside of you. It is within you right now. Sometimes we get caught up in our dramas and forget this. We see situations as worse than they are. Or we see them realistically, but feel "there is no hope in sight". But there is always hope. And there is always a solution. Which is not to say that the solution will land you where you were before the problem came along. But there is always something that can return you to peace, whether it's something outside of you or something inside you, like a thought. When it comes down to it, that's where all the problem is anyway, right? In the mind? Because even if we have a physical issue or an issue with a loved one, it's all dependent on the way you choose to think of it. So what it comes down to is this...the next time you're waiting for hope to come along and bless you, remember there is nothing outside of you that you can't find within. It was in there all along just waiting for you to claim it. Love NdeGT and love this post!